Aspiring Politician? Try Facebook to build your personal brand. Personal brand building through social media requires a strategically planned presentation of oneself to a general audience. This is by no means new within Indian politics. Consider the way Mahatma Gandhi first wore suits, and then other forms of dress before ending up with the well known hand-spun garments of an ascetic. In contemporary India, Twitter seems to be the most popular choice of medium for such an exercise, as exemplified by the current Prime Minister, Narendra Modi, who is active both on Twitter and Weibo and is even hailed as an Indian social media superstar with 14.8 Million followers on Twitter. However, in my own fieldsite at Panchagrami, the aspiring Politicians who are likely to be school dropouts find that Twitter requires a level of English that is intimidating. For them, the architecture of Facebook offers more possibilities, and the greater importance of visuals makes this a more appropriate tool for them and their followers. Saravanan, aged 28 years, is an eighth grade school dropout and now works as a water supplier for a local village governing council (called ‘Panchayat’ in India). He also assists the president of this council in matters relating to the area. Saravanan, is an active member of the current major opposition party in Tamil Nadu and an arch rival of the ruling state party to which the Panchayat president belongs, though, personally they get on well with each other. Wanting to establish himself as a politician, he had little by way of funds, but realised that the current local politicians had failed to forge links with the new middle class migrants to the area. He recognised that social media would be the best tool to help bridge this gap. Further, it would also help link with the increasing numbers of locals from the lower middle classes who were using Facebook. What stands out in his profile is that it is very visually oriented and has very little text. He posts pictures that show him as a person who is always working for other people and demonstrating his devotion to public service. He always wears a white shirt with a black pant, an accepted professional dress code for politicians, he regularly posts pictures of himself in party meetings with atleast 500 to 600 members in attendance and some of the the well-known party high command in view. Saravanan is pretty active in friending young people and the new middle class using Facebook to develop his social circle. A final advantage of this strategy is that by working through these visual associations and not overtly projecting himself he is less likely to antagonize the present members of the board. For him the effective use of social media is to use visual means to create and cultivate his image as that of “a common man” always in the service of people. Why do young men from lower socio-economic classes prefer shopping online? Most of us on social media have noticed the static advertisements that are displayed on the side panels or the advertisements that intrude upon the videos we watch on Youtube. While some choose to ignore them some view them as an irritating factor that impinges on their personal space/time, and while some see them as distracting to say the least, for others they may be informative. The views are as myriad as the advertisements themselves, and are relative to the social context of the viewer. However, this post is not about the different kinds of advertisements that get displayed on social media, nor is it about any kind of advertising strategy. My aim is simply to illustrate a finding, namely how advertisements on social media can transform the norms of consumption and shopping for the lower socio-economic classes in some societies by acting as a gateway to online shopping. Let’s explore the case of how advertisements on Facebook have driven young men from the lower socio- economic classes in Panchagrami, South India, to explore the world of online shopping, and thus escape from subtle discrimination and embarrassment they sometimes face in shopping malls. The young men of lower socio-economic classes in my field site have a fascination with online shopping. Though, most of them are school dropouts, one investment in particular that appeals to them is a smart phone with a 3G data pack. Access to Facebook or WhatsApp isn’t too far for these youth, as this becomes a natural extension of a 3G connection. Other than socializing on Facebook, another significant aspect of their activity on Facebook is clicking on the different advertisements, specifically those which display colourful clothes, shoes or hi-tech phones. While at the beginning most did not know how to buy from these e-shopping sites, they didn’t have to look far to find informal tutors to advise them. Most of these tutors were educated IT employees who hailed from the same area and were childhood friends of theirs. While it may seem as though their shopping on these portals is just a natural extension of them being on the internet or on social media, this turn to online shopping has much deeper facets that require attention. While most online shopping still requires plastic money (credit/debit card), the Indian e-shopping portals offer a cash payment model known as ‘cash on delivery’ which perfectly fits the cash economy that dominates this demographic. They don’t have credit cards and some don’t even have a bank account. This model lets them choose and buy products online, then pay in cash only when they receive the products at their doorstep. This service gives them access to things from t-shirts to trousers to slippers etc. through these portals, without the hassle of owning a credit card. Using e-shopping portals gives them an opportunity to experience better service and feel important. This was of particular importance because of the way they were treated by salesmen in malls who would look down at them when they asked too many questions, or if they asked for choices before they had made a selection. They also felt that, because of their skin colour, salesmen assumed that they could use their power and expertise to force products that they would never have chosen. They very often said that they felt helpless and like fools when they walked out of a store. They also often felt too intimidated and embarrassed to visit upscale showrooms, and often felt out of place. The salesmen often just assumed that they weren’t worth his or her time because they didn’t see them as a potential sale. So, when they would ask questions, the salesman would obfuscate rather than waste their time. However, this didn’t happen on e-shopping portals. It patiently showcased anything they wanted or even aspired for. Even though they had enough cash, a salesman always got irritated with them, but e-shopping portals didn’t. Further, anything you asked for came to your doorstep rather than having to go out looking for it. In addition to convenience, this service has allowed them to showcase their power and status in ways that they previously could not. The availability of cheaper products on these portals also allows them to consume products specifically intending to give them as gifts to their kins. This gift giving through buying things online automatically builds status among their social circles as well. However, when it came to buying electronics, like smart phones, they preferred a showroom environment so that they could feel the phone before investing in it. They still used the e-shopping portals to compare models, before going to a showroom. Let’s suppose they want a Sony or HTC phone, first they go to the e-shopping portal and compare the visual features, then ask their IT friends to help them with the features, then they compare prices and look for other models and the associated visuals and features, then, finally, go to Youtube to watch videos of how the phone works. They go back to evaluate the number of stars (gold stars) the phone has received on the e-shopping portal. Finally, they decide on the model they want and go to a showroom in Chennai to get the phone. Given that they are now equipped with knowledge regarding their intended product for purchase, they are more confident when it comes to shopping in mall showrooms and don’t feel intimidated with either the ambience or the salesmen. They often felt that they knew more than the salesmen after this process of acquiring knowledge about the phone through social media. In other words the collective social knowledge that social media offers, transforms their shopping experience itself, from just being a passive buyer to an assertive consumer, who wouldn’t be put down so easily. Such experiences have led them to click on more advertisements, as they realize that it was these advertisements that actually offered them a window to a new shopping experience. It’s OK to send my boss a WhatsApp message! Mahesh, 28, an ITES (Information Technology Enabled Services) professional met with me for lunch in one of Chennai’s well-known vegetarian restaurants. He works three days a week from his company’s branch office located in the Indian field site – Panchagrami – and two days from the company’s Chennai office located close to this restaurant. Over special vegetarian Thali meals, we discussed his life, his ambitions, his family, his presence on social media etc. When I called him up to schedule an interview, he arranged for us to meet for lunch before his work shift that started at 2 PM. Though we met at around 12:30 PM, he seemed pretty relaxed and unrushed and the lunch interview kept going until around 1:45 PM, when he excused himself to let his boss know that he would be running late for work by approximately 30 minutes. He got his smart phone, a Samsung Galaxy out of his pocket and typed something into it and sent out a communication in less than 20 seconds. I was pretty surprised because, it normally takes at least a minute for an official communication to be typed and sent over an official email server with all the salutations normally required in an official communication. So, wondering if he had already typed an email to his boss, I asked him what he let his boss know, to which he replied that he just sent a WhatsApp message to his boss letting him know that he was delayed over a meeting and would report in shortly. This triggered a conversation that was extremely informative. I asked him why he didn’t email his boss and why did he choose to operate and communicate over WhatsApp. Soon, it became extremely clear that WhatsApp was fine enough for communicating mundane official matters such as informing that one was running late to the office or to a meeting or to meet at lunch etc. and that it was replacing what Short Messaging Service (SMS) did originally. However, important official communication always happened through official email. But, communicating to one’s immediate boss on mundane official matters now moved from text messages to WhatsApp messages. So, why did this happen? Because everyone is now on WhatsApp, almost all have a smart phone connected to the internet with WhatsApp as an application, which people would keep checking on a constant basis compared to SMS and WhatsApp is free to use. These factors led to people using WhatsApp messages more often than SMS. Naturally, the next question was geared towards Facebook (FB). I asked him if his boss was his friend on Facebook and were they on FB messenger on an always signed-in mode. He replied ‘yes’. So, why did he still choose to communicate over WhatsApp rather than Facebook? He considered WhatsApp more official compared to Facebook. It seems like one of his teammates had actually sent a message to his boss over FB and was frowned upon, as somehow FB just didn’t seem official enough and equated everyone to a being just a ‘friend’, thus breaking hierarchies, while hierarchy was still maintained over WhatsApp. So, did people in his team ever communicate with their boss over FB? They did for more for personal communication such as ‘liking’ something, forwarding a moral message, spreading the word about an office party or get together etc. but nothing related to an official one-to-one or one-to-many sort of communication. He made sure to add that he would never communicate to his boss’s boss over WhatsApp, it had to always be over an email. The vertical span of use of media seemed extremely interesting. I was immediately reminded of the concept of polymedia, termed by Madianou and Miller, 2012 and also on how an important person in a network influences others in the network to choose media through which people communicate to him. In this case, Mahesh had three ways of communicating with his boss – over email, over SMS or over WhatsApp (in this case was influenced by the boss, who was fine with communication over WhatsApp and had added it to the list of official communication tools). Cricket, cinema, politics and religion are things that interest Tamils the most. This is not only reflected in their offline lives but can be witnessed online too, especially on Facebook. 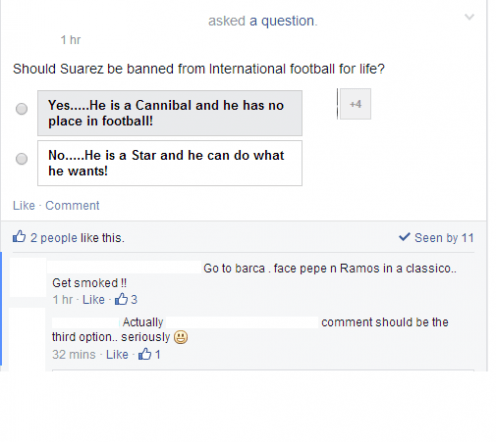 Now, where does football fit into all of this? Though football isn’t something that is entirely ignored, it really doesn’t scale up as cricket does. It is one game which is constantly encouraged in schools during the physical training hours next to cricket, but, it really doesn’t have the same following as cricket does. However, it is nonetheless more popular than hockey, which is India’s national sport. Most men would tell you that they were exposed to football during their school days, but, as a sport the interest in it gets restricted to their school/college days, compared to their interest in cricket which is carried on to their adult life. However, the scenario is not all bad as there are people who do follow football feverishly and know each team’s statistics by heart, but, the numbers just don’t match cricket. 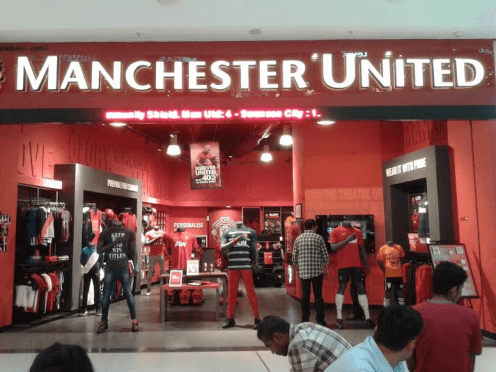 Chennai, the nearest city to my fieldsite – Panchagrami – has a Manchester United clothing shop in a famous mall and people do shop there, some for its brand value and a few as fans. So, how does the recent FIFA World Cup 2014, score in this scenario? While Brazil wakes up to football, it’s almost bed time in India. The live telecast of the World Cup starts only at around 9:30 PM which is almost past dinner time for most folks in Tamil Nadu, India. The first match at 9:30 PM isn’t too tough to follow, but the next slot is close to midnight and the slots thereafter most often takes a toll on people who work. They go back to work like zombies if they stay awake watching the entire series the night before. So, people following the live action of every single match is rare. These night slots come at a disadvantage not only to fans but also to the hospitality industry. Star hotels, restaurants and bars do play the matches live, but most have a time constraint and normally don’t go over midnight. Though replays of matches do take place in the afternoon, football isn’t really treated as a great marketing option during weekdays, though weekends are slightly different. 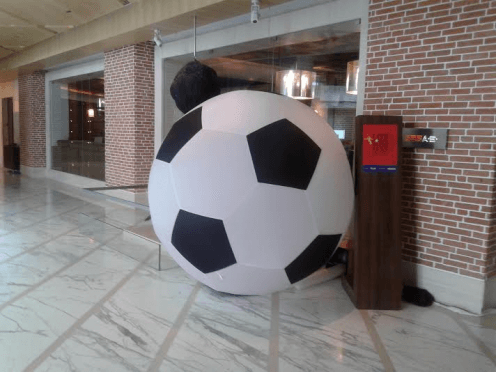 There is only one five-star hotel in Chennai which has taken football to be a serious way of marketing and attracting fans to dine in and has activities related to the sport 24/7. While a few others do consider this an attractive marketing option, most places haven’t really bothered too much with the idea. Bars and restaurants in Chennai (specifically those in star-rated hotels) play football on their television sets, however, most go on only till about midnight and close down, so catching the live telecast from Brazil in public places is difficult for most people here. The other issue is with the concept of bars in Tamil Nadu. The bars here are of two different kinds, the first type is attached to the local government-run alcohol shops called TASMAC. But, most middle class men prefer not to frequent this bar and opt to take alcohol home. Further, there isn’t any facility here to watch football. The second kind of bars are those that are mostly present in star-rated hotels or exclusive bars/restaurants and can be pretty costly compared to the local government-owned alcohol shops. So, people frequenting them would normally be people travelling on business or upper middle class/rich folks. However, irrespective of the bar one frequents, if one decides to drive back home, with the stiffening of rules against drunk-driving, one is almost certain to get caught by the law and shell out loads of money (either as a fine or at least in terms of corruption to avoid a fine). Some clubs do offer football viewing during dinner for its members, while most often the television sets in gymnasiums play them as an option along with cinema songs. The scenario in coffee shops is not too different. Though some do have replays of football matches instead of cinema songs, most prefer cinema songs to match replays. 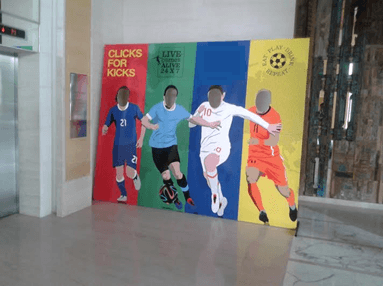 Most often one can catch some advertisement/sign or symbol related to the World Cup in the form of a commercial product. 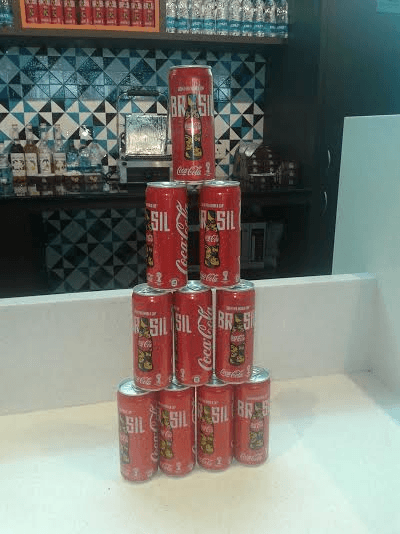 Coffee shops don’t spend money putting together advertisements or banners of the Football World cup, but willingly display beverages bearing the symbols of the World Cup. For example, Coca Cola cans which have the World Cup advertisement on them. The constant scene of people who watch windows of shops/showrooms with a television set playing a live stream of the cricket World Cup matches isn’t seen with the FIFA World Cup. Though, the time at which the matches are played might be one reason, the other would be that football just doesn’t interest people here as cricket does. Private viewings in homes do take place in Chennai. However, except for a few nights in the season, most stop watching past midnight during weekdays, due to work day schedules. The only store which has a dedicated football brand Manchester United also only plays matches of the team and not the FIFA World Cup, as a store associate expressed his concern of attracting too much of crowd, if the matches were shown in the store. However, the time of live relay of such matches was also something that did not work out in their favour. 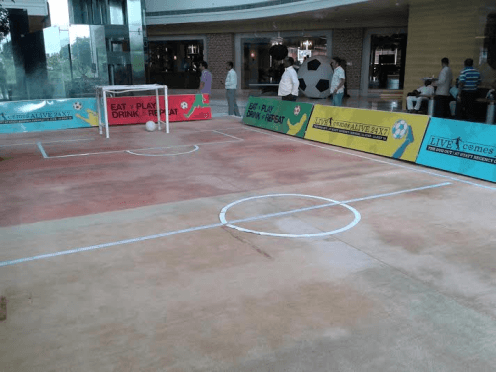 One definitely cannot ignore the World Cup as there are vinyl hoardings and the media (print, radio and television) constantly relays news of the World Cup. Most often people seem to prefer watching news slots of the matches or just get the scores from the internet rather than watching it live. Discussions at offices or schools on football aren’t as frequent as they are regarding cricket. By contrast to the above scene in Chennai, Panchagrami, which lies in the outskirts of Chennai offers a completely different scenario. What hits one is that there are absolutely no vinyl hoardings of football. Further, there are no commercial enterprises that offer an overt advertisement related to football. The only place which has a public viewing of football matches is a star-rated hotel at Panchagrami, situated on a major highway. It offers football match viewing between 7 PM and 11:30 PM every day available only at the roof-top garden restaurant, opened newly at the hotel. However, the screen where the match is projected is pretty small and unclear. Interviews with the restaurant staff revealed that when families dine in, they really don’t pay too much attention to the matches and most aren’t bothered about them. Some have even requested the staff to change channels (to play cinema songs) as the sport seemed boring to them. However, the staff were ready to admit that excitement picks up only when groups of young men come in to dine and specifically only when they consume alcohol. This normally seems to happen on weekends rather than weekdays. Every evening there are men who travel on business who dine in at the hotel and sit alone to watch the game, just until they finish dinner, most often out of boredom rather than an interest for the sport. The same was true of a coffee shop in the area too; they were content playing cinema songs rather than the World Cup as they felt that cinema songs were much better received by their customers. When probed deeper, they did say that a few customers mostly men, sometimes requested the staff to change channels for a few minutes to update themselves on news related to the football World Cup. Again, timing for catching live action of the World Cup just isn’t suitable for most people nor does it suit the business. The corner tea shops are normally the spaces where communication of world news is witnessed through informal discussions. Frequenting some of these tea shops revealed that people did speak about cricket in the last week and never once mentioned Football. Informal chats with a few in these tea shops revealed that they just didn’t care about it and were content getting a glimpse of it from the local newspapers. Most of my informants in the past week were posting pictures of their favourite cricket/cinema stars and political figures. They even Liked pages of their favourite stars, teams or political leaders. I haven’t found even a single posting on football. Even IT workers staying here weren’t really bothered putting up posts on Facebook about football. Interviewing my younger group of informants, revealed a few interesting findings on why they don’t post anything about football. None of their friends were interested in it. It doesn’t allow girls to Like/Comment on their posts – while they did say that the chances of women Liking/Commenting on a post related to cricket was more. In other words, they meant that football was more masculine and could keep away women from actively participating in their profile (through Commenting/Liking). 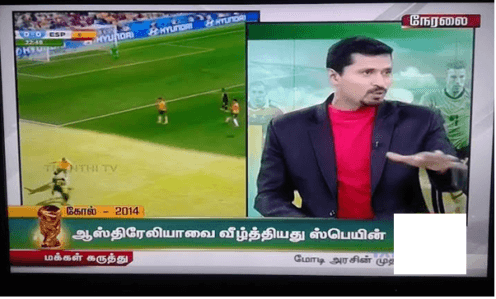 However, a few did say that they did receive WhatsApp messages from some of their work/college friends about football and most of these friends were from Chennai and some weren’t even native Tamils and hailed from West Bengal or Kerala where football is much more popular. So, while some reeled off statistics they had collected from their office colleagues and from newspapers, they did accept that the discussions on football weren’t as intense as cricket. 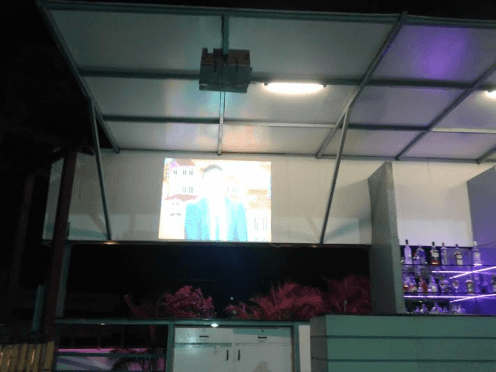 The online forums/discussion groups of upper middle class residential apartments also did not have any messages asking for people to join in a public viewing of the sport. However, talking to an International school in the area revealed that they had football coaching sessions over weekends. Attending a few sessions over the last couple of weekends showed that the fathers normally encouraged their sons who were attending coaching sessions to watch World Cup matches. There was a strong family (father-son) bonding that was visible through their discussions on Football on the practise ground. Some were constantly referring to a few You Tube videos of player interviews and techniques. But, other than a few matches they watched during weekends at home or at a Star hotel, most agreed that watching live action of the World Cup just didn’t suit their schedule or timing. However, they did catch up with the scores on the internet. There were a few men who did agree that they used football as an excuse to go out drinking (alcohol) together as a group. But they just didn’t bother posting about it online, as they didn’t want their wives to know that they were out boozing in the pretext of watching Football. Most of my male informants did agree that they had played football and liked the game, but it was soon very clear that playing a sport needn’t necessarily transition to following the sport. Interviewing and constantly checking for updates on Facebook profiles of my informants about their interest in football revealed yet another dimension – women loved cricket more than they did football. None discussed football. Football, they said was very masculine and somehow it just didn’t suit them. However, they did accept that if they had grown up watching football as they did cricket, maybe they would have loved it and changed their favourites. But, it just doesn’t seem to be happening in the near future. In conclusion, football still hasn’t diffused into the boundaries of Panchagrami as it has in Chennai. As the area transitions, there might be a greater number of Football fans in Panchagrami. Further, the timings do hinder those who might want to give it a try in Panchagrami. 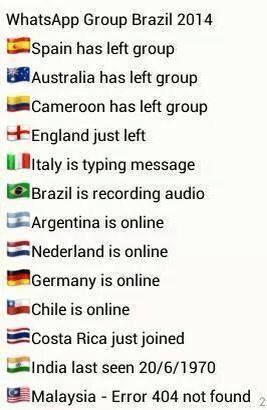 As the final match of the World Cup gets closer, maybe people would be much more interested and would start following the World cup. However, at least people catch a glimpse of it in newspapers or on television sets and do update themselves and the situation isn’t as bad as hockey – supposedly India’s national sport – of which people know much less than they know of football. 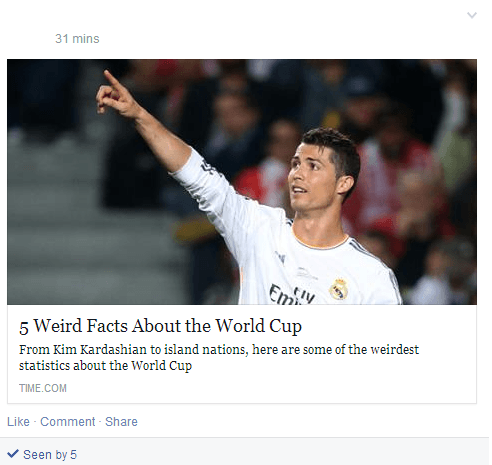 This article is part of a special series of blog posts profiling how social media is affecting how ordinary people from communities across the planet experience the 2014 World Cup. Most disciplines have formal methods for collecting data. By contrast the critical issue for ethnography is the task of transforming ourselves into the kind of person we need to be in order to conduct successful fieldwork. Someone people in the area feel comfortable with, would wish to make friends with and have confidence in. Since our method is in essence the cultivation of good relationships with our informants. Each of us has had to learn this sensitivity to the field and often change their appearance and behaviour accordingly. For example Shriram found that when he started his fieldwork in South India he wore a t shirt and jeans. Practically no one would speak to him. But when he tried to go to the other extreme and conduct fieldwork wearing a formal shirt and trousers, he found that most people thought he was trying to sell them something. In one case after patiently explaining to a school the nature of our project and the research he would like to conduct the school teacher apologised but said firmly that the school was not really interesting in purchasing this `anthropology.’ Eventually he took further measures. He pierced both his ears and started wearing hand spun kurtas and `intellectual wear’ to clearly position himself as an academic. After which the fieldwork went just fine. Juliano has found his fieldsite to be a split between evangelical Christians and others, and he needed neither to look like a `person of God’ or `person of the world’ so instead of dressing like either of these, he went for a European look that managed to be a neutral ‘gringo’ look that meant he could talk with people from both sides. Jolynna, by contrast had to take off most of her clothes, and adorn Carnival costume before those associated with the creation of Carnival camp that she wanted to study would speak to her. 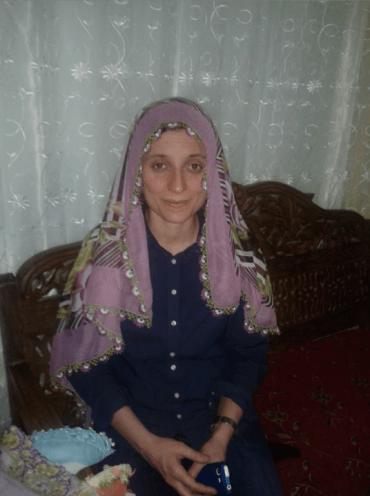 Elisa found that she had to shave her legs and underarms more carefully than usual since even to show a single hair where the legs or arms are not covered could be seen as shameful in this part of Turkey. She also found she had to keep the house immaculately clean. Tom suffered from the quantity of strong alcohol he was expected to drink in local ‘feasts’ since that was the basis of male solidarity and commensality in the village where he lived. Danny found that he had to retreat from the more participatory nature of ethnography to more formal interviews since that was what people in England seemed to expect of him. On the other hand when looking at the subsequent interviews he didn’t find that the teenagers he worked with at schools had talked to him any differently as a middle aged man that to his colleague Ciara Green who is young woman, so the assumption that he should, for example, talk to boys and her to girls, turned out to be an unwarranted `strategy’. Nell got censored for drinking straight rum without a mixer, but also suffered considerable sunburn from having to hang out for long periods outside in the North Chile sun. Xin Yuan found that she had to dispense with the clothes she normally wears and adopt the bright patterns preferred by local people. Finally Razvan found he had to shift his behaviour and demeanour between four groups he was encountering: the students, the professionals, the friends and those for him his being a husband seemed most appropriate. The other area of sensitivity which proved very variable was how we managed our own Facebook/QQ profiles. For example Jolynna at first tried to follow Danny’s advice and adopted a very neutral passive profile in Trinidad. 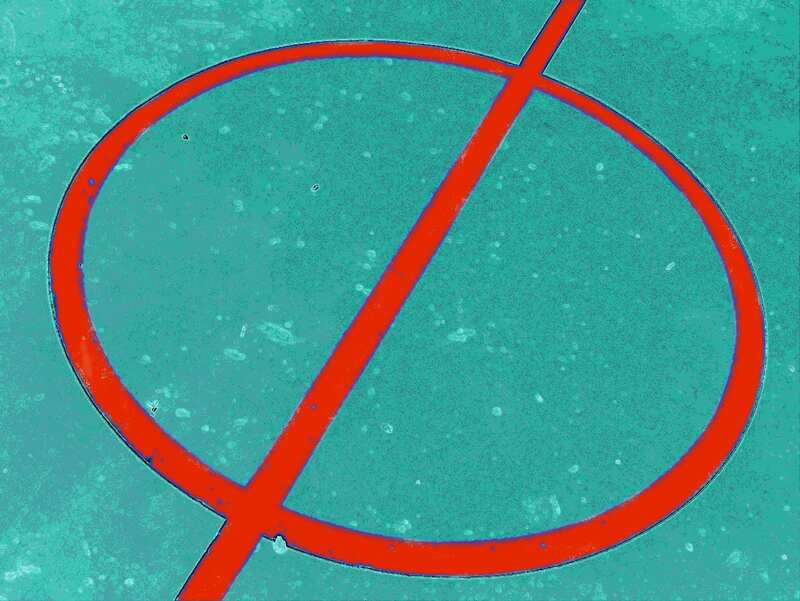 She soon found this was entirely inappropriate and had to replace it with a very active one in which she posts frequently in order to make people comfortable, while, by contrast, the same strategy was correct for our English site where we post nothing at all in order to affirm that this sites exists solely for the purpose of research. Xin Yuan in the meantime blinged up her QQ profile with music and colour but also postings about her life in England in order to make herself look more interesting. All of which confirms a basic premise of anthropology that methods are not things you start with. Rather it is only when you have learnt about the nature and preferences of the particular populations you are now living with that you can also determine what are the most appropriate ways of interacting with them and at least try to conform to their expectations. The above cartoon says it all. There are quite a few cases here in my field site as well as in the villages closer to it where this sort of double existence on Social Networking Sites (SNS) seems natural and required. The thinking being that this was the right thing to do in order to avert caste problems or issues of any sort. While this sounds like a great strategy to follow, when seen superficially, this actually indicates identity confusion. This seems specific to the rapidly transforming (urbanizing), rural areas especially closer to bigger cities. Given that my field site is one such peri urban area, I encountered such an identity crisis in my informants quite often. This identity crisis of a person of a rural background (specifically young men/women) suddenly finding himself/herself in the midst of a rapid urbanization, manifests itself on social networking sites, where you have one caste based SNS profile and another more secular one. The idea is to not really mix these two as you tend to now live both the lives at the same time. However, my informants feel that it sometimes becomes confusing on who they really are and what ideology they really subscribe to. 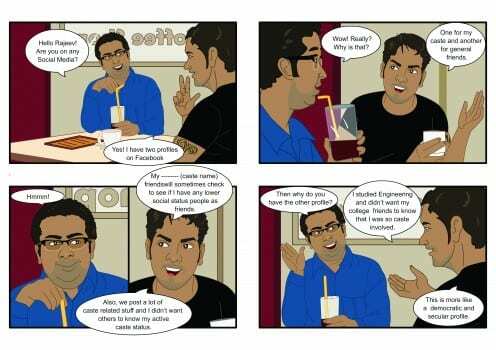 So when I asked Rajeev (the person in the cartoon), which profile would thrive for a longer time and which profile is a true reflection of himself; he said he really didn’t know. But, he was quick to add that it might be the one which is secular, since he thought that he might move away from the village looking out for a job sometime soon and secular was the way to go. However, once again, he reverted to saying that he might still have both the profiles separate without anyone (except for a handful of friends) from either of these profiles knowing that the other one exists, since he didn’t want anyone from his village to be offended. I asked him if he liked his caste based kin and his activity on the caste based profile; he replied that he loved it, as it was what had made him what he is today. But, he thought the secular profile from his college days was also important since it was the one which gave him his friends’ network, a great worldview and a politically correct picture of him. After multiple interviews with such informants, it became rather clear that they were in a way struggling to understand and see who they really were and what was the image they were trying to project to the world. It was like they were being pulled on both sides by two opposite ideological forces at the same time. Escaping the geographical boundaries of the village seemed to be a solution to end both the social control and enabling the merging of identities. However, the emotional attachment to one’s caste and kin made them to hesitate to leave the caste based boundaries. Maybe, their identity itself was about existing in both the worlds at the same time and this is what is very clearly reflected on their SNS profiles. The best part of a longitudinal Anthropological study is being a witness to the changes that happens in the mindset of the people you study over a period of time, in my case just 10 months. When I first came into Panchagrami, there was a group of five young men who had just signed up for a Facebook membership. They were all first generation learners from a rural background. As with most new young Facebook members, I witnessed their constant competition in making and grabbing as many friends as possible on Facebook. The first step they always seemed to take was to friend everyone they knew offline by searching for their names on Facebook. Then they went ahead and friended people who were Friends of Friends and mutual members of a group or a page that they Liked. But, this seemed to take a turn a couple of months ago, when one of my informants from this group, casually stated that he was banned from Facebook, meaning that his account was suspended for a couple of days. This was pretty strange and when further probed, he stated that he was thrown out because he had sent Friends request to strangers (read “foreign women”, specifically Caucasians) and Facebook had his account suspended as he seemed to be spamming Friend Requests to people he just didn’t know and who in no way shared any mutual friends with him. This was not the first time this happened to him. In fact, the first time Facebook had his account temporarily suspended he didn’t even know why his account was banned. But, he seemed to understand from the trend of account suspensions, that whenever he sent out numerous friends request to people (women) he didn’t know, his account was automatically suspended, or at least this was what he attributed his temporary account suspension to. In a few weeks’ time when hanging out with this group, the others in the group also started boasting of this trend. Each one was boasting about how many times they had their account temporarily suspended in the past one month and the story that went with why their account was suspended. Each of them saw this as a game they played; the more number of times their account was temporarily suspended and the number of days their account got suspended with the story of why their account was suspended earned them brownie points within the group. When asked the reason they did this, they just seemed to want to turn the table on Facebook by changing the “punishment of temporary suspension” for trying to make genuine friends abroad, to merit badges. So, now the yardstick for heroism had shifted from the number of friends they made to the number of times they rebelled and were suspended for trying to make (read “spam”) friends. It is also interesting that a couple of these informants have now created a second profile on Facebook just to spam Friend Requests and get their account suspended temporarily in order to increase status among within their peer group. They also maintain a separate genuine Facebook profile.